Expats who lost free access to BBC favourites such as EastEnders when a satellite beam was switched off were reported to be "distraught" and "running around like headless chickens". A BBC spokesman said they were never supposed to be able to watch the corporation’s domestic service, since it is only supposed to be available to licence payers in the UK, Channel Islands and Isle of Man. The service was switched to a new satellite on Thursday, Feb 6, which will improve reception for the target audience and prevent the "overspill" beam from extending to southern Spain. Expats in Spain who want to continue watching the BBC will have to pay for a satellite package such as BBC Worldwide instead, or find a way to stream programmes via the internet. 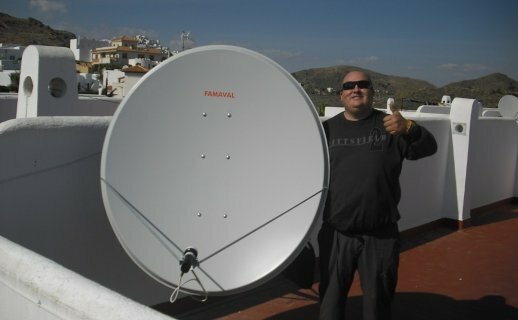 The satellite switch means some may also have lost ITV reception. The Olive Press reported that viewers in the Costa del Sol are affected as well as those in Andalusia, southern Portugal, much of Catalunya, the Canary Islands and Italy. Fiona Catchpowle, who lives in Cartama Estacion, near Malaga, Andalusia, said she will watch the BBC via the internet instead in future. "It will probably encourage me to watch more Spanish TV if I am somewhere that doesn't have an alternative solution. Although it must be said the quality of programming is poor, compared to the Beeb, " she told Telegraph Expat. "If I didn't have a solution myself, I would certainly miss certain programmes, such as QI, Tudor Monastery Farm and the occasional EastEnders omnibus." She admitted: "All UK broadcast channels are a guilty pleasure we should never have been watching in the first place, due to licensing regulations. There are, however, many people in the expat community who are distraught at the loss and will miss their little piece of the UK and are rushing to find a way around it." The Olive Press quoted expat Het Farrington, of Vilanova Cataluna, who said: "There are people running around like headless chickens wondering how they can get it back." A BBC spokesman said: “In the early hours of Thursday Feb 6, the BBC’s free to air satellite broadcast footprint was optimised – . This also means the overspill of the BBC's services has been reduced, so viewers outside the UK will find it even harder to receive them. This is appropriate because the BBC’s domestic services are for licence fee payers living in the UK, Channel Islands and Isle of Man only." An ITV spokesman said: "ITV is a UK-only broadcaster, and does not have a licence to transmit our domestic family of ITV channels outside the UK and we do not seek to promote these services elsewhere. "If people could access our content outside the UK, this was by default and not by design. As part of the satellite operator's ongoing renewal programme, our services have recently transferred to new satellites with a tighter beam."